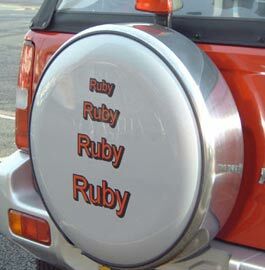 We can personalise wheelcovers in a number of ways. The cheapest and longest lasting is to apply cut vinyl lettering using any of our fonts or vinyl colours. We can also use a reflective vinyl to really stand out. This type of design has an 18 word maximum. More popular are the full colour printed designs. There are two types. 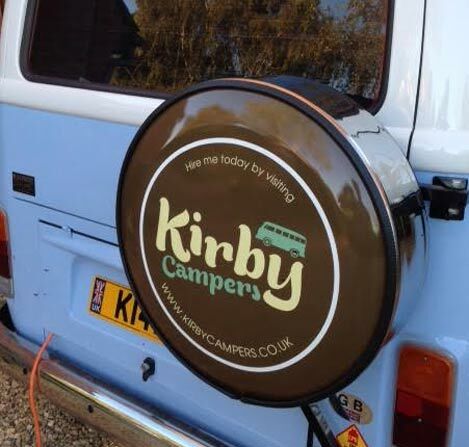 The standard full colour wheel cover is printed vinyl which is applied to the flat centre of the disk. This can also be laminated for a longer life span. We consider the best of all to be the full wrap stainless steel wheel covers which covers the whole disk including the curved area. These are laminated as standard. The wheelcover to the right is a full wrap. 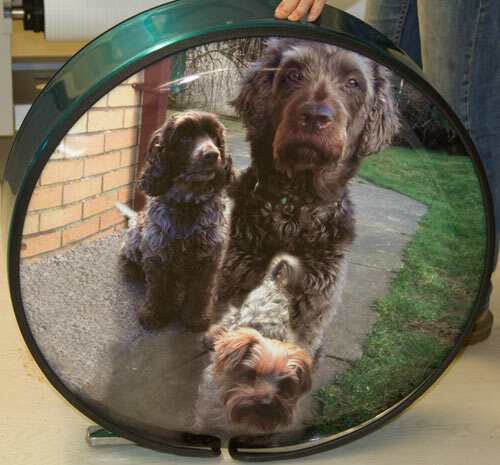 It is also possible to wrap the steel rim with a plain colour or one of our full colour background images. 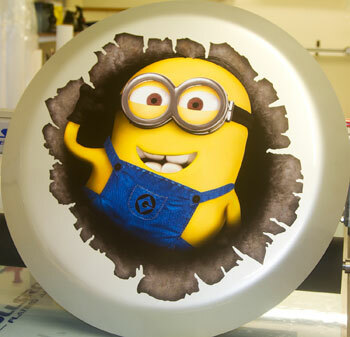 NB For wheel cover size - 285/55/R18 - please add £50 to prices above. It is very important when ordering a stainless steel wheel cover to give us the diameter & width of the tyre as well as the tyre size. 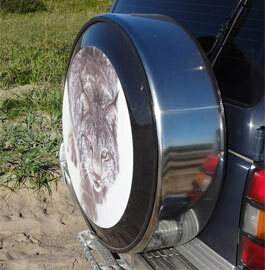 We can include images on this type of wheel cover but they must be silhouette style without any fine lines or shading. We have a whole range of standard images available @ £7.50 or you can send in your own image at £27.50. You can sent it in as a jpg, png, gif or tiff file and we will will convert to a vector file for cutting. For full colour printing Digital images need to be large enough to print at a size of 600mm (24"). For a good result the image needs to be at least 2000 pixels in diameter. NB - The quality of the printing can only be as good as the artwork we receive. Images or print ready artwork can be supplied in the form of - tiff, bitmap, jpg, psd or pdf files.